Because my light fixture is so large, I wanted to use a flower container that felt in proportion. I really like this galvanized bucket…the only bad part was that I needed a lot of flowers to fill it! I ended up getting forty stems!Oh, I just remembered that I’ve never shown you the new light fixture that I got for this room until now. I ordered it last fall, let it sit around in the box for a few months and then shortly before Christmas, finally talked the Mister into putting in up. I just love it! It’s covered in a warm white burlap…it seems more me than the old fixture that was previously in this spot. as your neighbor slightly to the south in IL, i can very much relate to your feeling about winter. we have snow piled high here too 🙁 we just got back from sunny AZ, where there were citrus trees in my mom's yard…really miss those! bet your grapefruits are yummy! your dining room looks gorgeous with the tulips and light fixture AND everything else in it…sooo pretty! lovely photos too, of course! have a great weekend!! I got so excited to see your beautiful dining room! Your new light fixture is stunning! You are always a master at styling and photographing flowers! Your post is such a beautiful treat! I can't wait to see your living room post soon! I hope spring comes to the midwest soon! it looks so inviting with a touch of relaxed elegance. So very pretty! Tricia, you can do no wrong!!! wonderful colors those flowers!! F.
I have learned so much from your blog about taking photos..you are simply amazing and I thank you for you sweet way you share! Your new light fixture looks so nice over your diningroom table! I have a similar pale burlap lampshade on my nightstand lamp and I love the soft light it gives off. Everything looks so pretty ~ enjoy those bunches pink tulips! I think we have the same table runner ~ PB, right? 😉 I so hear ya.. I keep watching the weather reports to see when all this snow will melt. Me and the kids are just aching to be outside. The pink tulips are so rosy! Love the new light fixture. How beautiful, Tricia…just what I need to think of spring! Your posts always make my heart go a pitter-patter! lol It's all so gorgeous! I'm lucky to have such an inspiring blogger friend! Sorry to hear about the cold – it's warming up over here, though it can get way too hot in the summers where I am! 🙁 Wishing you a wonderful day! Tricia, what a beautiful post! I love your home. The pink tulips are just gorgeous!! Your tulips are gorgeous. A real blast of spring is exactly what I needed. Your new light fixture is awesome. I'll have to go see what the old one looked like, but this one is pretty special! OK, just checked it out. I can't believe what a difference a new light fixture can make. Totally different look. I can tell you are going to get Pins for these photos. I pinned one already. wonderful pics!!! I love the atmosphere in your beautiful home!!! 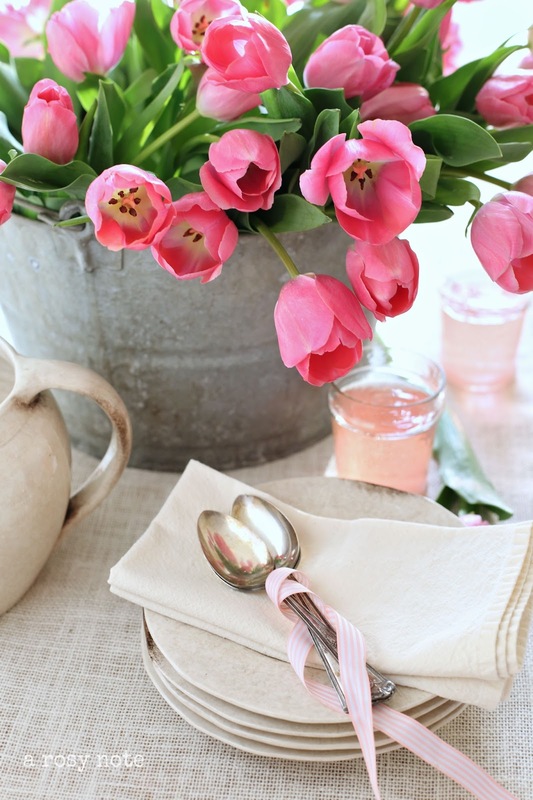 Love your beautiful pink tulips…so pretty! And the new light fixture is great. Your pink tulips are just gorgeous in the galvanized tub. The whole room is so full of light and looks like a breath of spring blew in. The only times my rooms are that bright is when there is snow on the ground and then I take as many pictures as I can. You have a most lovely home. The only spring I am feeling is what I buy at the grocery store wrapped in florist paper…love your pink tulips, wow 40 that is a goodly amount of tulips. But they look terrific in that galvanized bucket. Sweet!! Oh, no one can make a galvanized container look as classy as you do, Tricia! Absolutely fabulous images! I'm loving your abundance of tulips and grapefruit! You have an amazing eye for styling, just stunning photos. Oh my goodness, those pink flowers are stunning! And your photos too! Your springish feel is wonderful, Tricia, and much needed here. Last night "they" told us it was supposed to be just a lot of rain. Your new pendant is fabulous!!! You are creating the most amazing home and your photography is fabulous!! Your dining room is fabulous! Love the pastel colors and the flowers. Simply gorgeous! I love your flowers! Bella decoración, las flores son preciosas y las fotografías excelentes! !.Abrazos y feliz fin de semana. What a beautiful composition! I also bought tulips to bring spring into my home 🙂 Can't wait to see your hydrangeas – I love them, too! Have a wonderful weekend! Love the new lighting (where did you get it?)!! The flowers are a beautiful invitation for Spring to hurry up and arrive! What a beautiful post. I just love your photos and your house looks so pretty. My sister used to have a huge apricot tree in her yard. I loved to go pick bag fulls of apricots. Then she moved. Now I find it hard to buy them. They are so expensive and they don't even taste as good. I do hope you get some spring weather soon.. So, so very gorgeous! I love your home…your style! You have an eye for beauty! Wow, your photos are stunning. Talk about inspiration. If this post doesn't speak spring, I don't know what does. Your home is just so welcoming and bright. I love it. I am your newest follower. I hope you can follow back. Love your dinning room-cant wait to see more of your house. Pink tulips are my favorite.your photos are beautiful. As always, I am totally in love with your home and photography. If only you lived closer to me then you could come over and teach me a thing or two (or twelve). Love the set up and your home looks so beautiful.. love pink tulips. Your photos are truly amazing and your home right out of a magazine! Truly enjoyed my visit here! Beautiful photos, just perfect in every way. I love your pretty tulips they are a gorgeous shade of pink and the bucket is perfect for displaying them. Love your new light fixture too!! Your pics are beautiful! I'm sure the snow will be gone soon and it will then feel more like spring in your area. I love your new light fixture, it looks erfect over your table. I would love to have you join us at my linky party that is going on. Tricia, your dining room is one of my favorites and has been since I first visited your blog! I absolutely love your new light fixture – it fits perfectly. The tulips and grapefruits just scream spring – love it! Your home is beautiful. I love your dining room. My heart was racing as I looked at it. So gorgeous. I am a new follower. You make everything look perfectly dreamy. What a beautiful table setting! I love all the pink tulips and I love the chair covers. Nothing says spring like bunches of tulips! Your dining room is simply stunning as are your gorgeous photos and your new light fixture is so pretty hanging over your table. I would love to have citrus trees outside my back door! I Tricia! Tomorrow I am heading up to Iowa! I checked the weather channel and it looks like I am sure to see snow, ice and rain LOL! That light fixture changes the whole mood of your room, it's perfect! and those amazing tulips look like a soft watercolor painting!! oh wow…I have dropped by before and am in love with your beautiful cabinet in your dinning room…and with the great fixture..WOW! 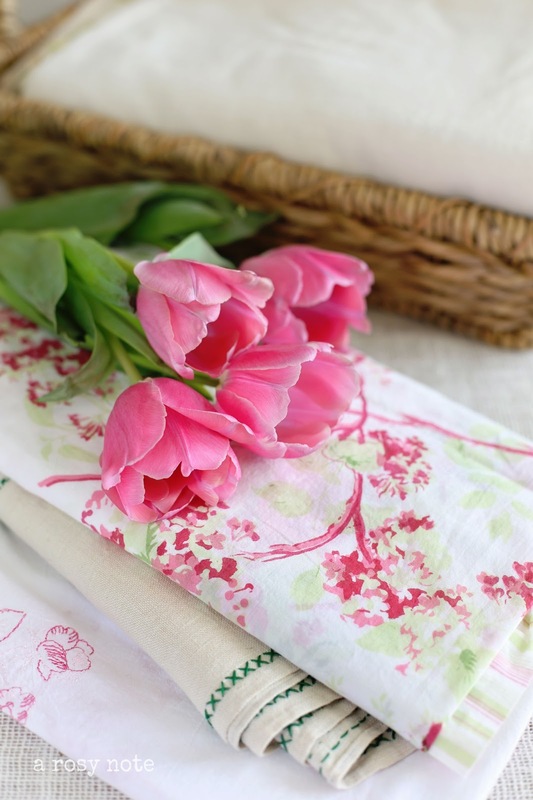 But spring it is in your home with those pretty tulips and those colour perfect grapefruits! What a beautiful light fixture! I love how it goes with your dining room, which is also beautiful, too! up in my post, tomorrow. citrus hanging in the trees! Your dining room is lovely and your photos….just fantastic!!! I've been visiting your previous posts and I enjoyed your images a lot, congratulations! What a stunning room! Love that light fixture and that pitch fork I see peeking out. Fresh grapefruit would be heavenly too! Love the dining room! SO glad I found your blog- we share a similar style and the same first name! So beautiful! My favorite flower is the pink tulip! You have inspired me to purchase an arm full of tulips on the way home! where did you buy your stems? gorgeous!!!! And, where did you get your drum shade? We have a huge one that I ordered from Pottery Barn, when we moved in this house….I love yours! I just love your style! Where did you get your burlap chandelier? I love it and have been looking for something just like it. Thank you!